In our house we have to have foaming hand soap. If for some other reason I don’t then you should hear the complaints. I guess it’s just more fun! 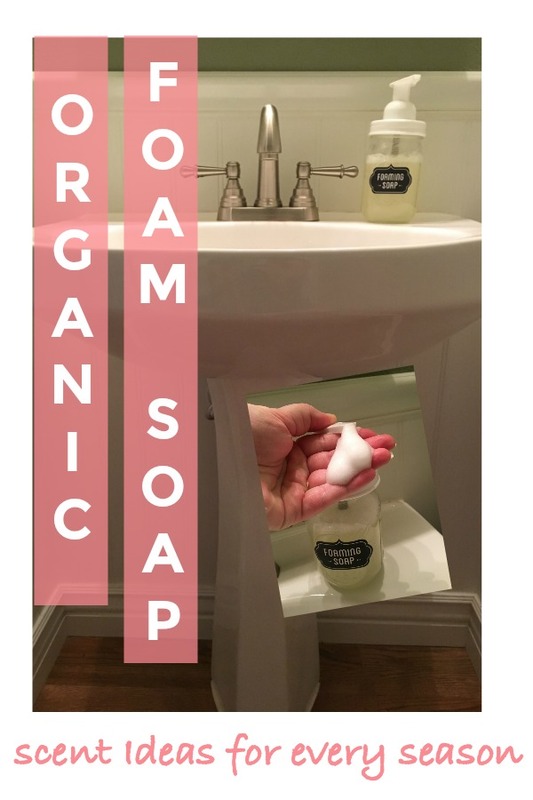 I then realized how EASY and how FEW ingredients you need to make your own and now we always have Organic Foaming Soap in our bathrooms. I put essential oils in my mine for the scent and the great part is you can always make a different soap this way! Of course we have a Summer scent going on now. And you’ll notice I use all organic ingredients, though this is definitely optional. 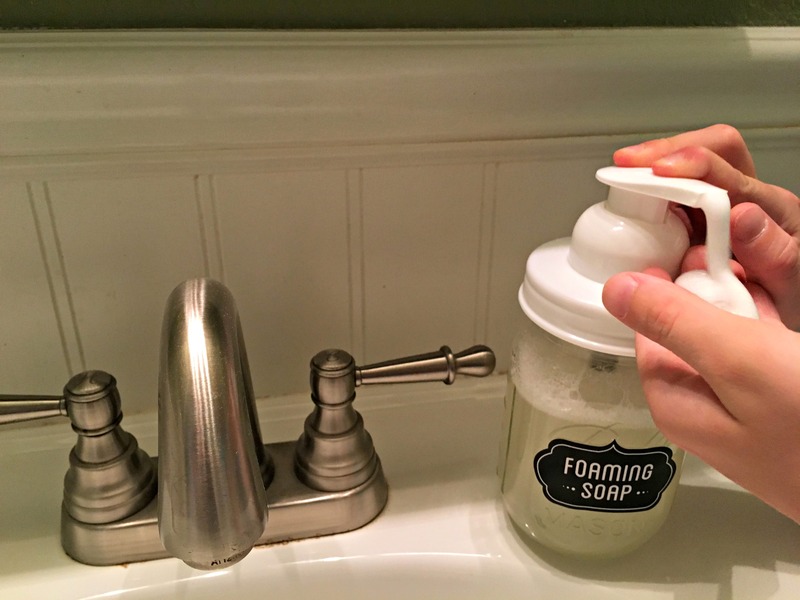 Foaming soap container. I like glass and my 16oz mason jar style comes with the stickers! 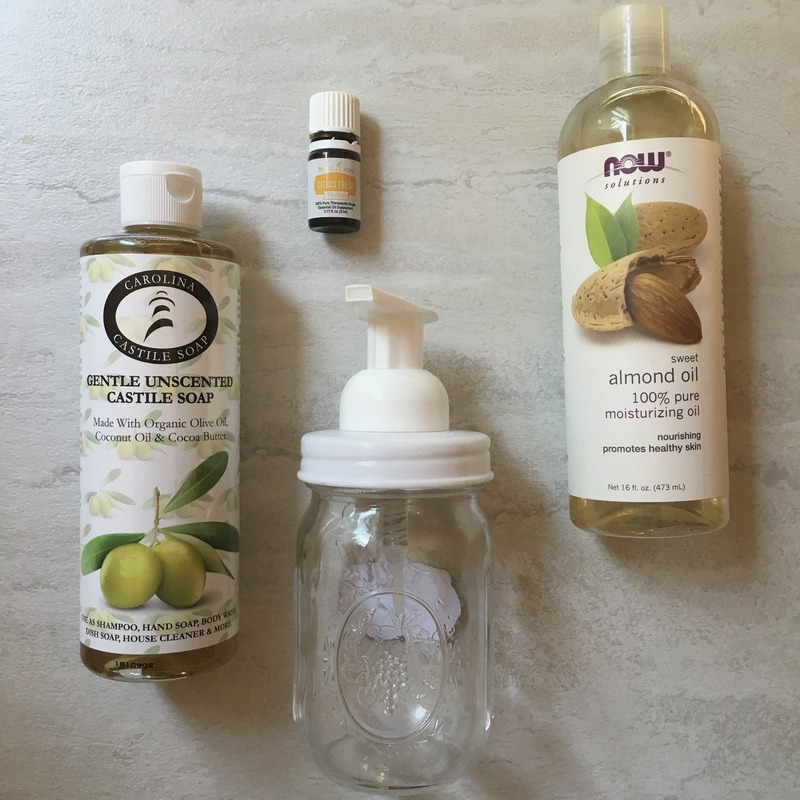 2 tbsp unscented castile soap. I like this one because it’s made from organic olive oil, organic cocoa butter & organic coconut oil. 2 tsp of sweet almond oil. You could do without it, but my goal is for the soap to make your hands soft and healthy too. 10-15 drops of essential oil of your choice. For my Summer theme I used Citrus Fresh from Young Living. The individual oils in this blend are: Orange, Grapefruit, Mandarin, Tangerine, and Lemon oils with a shot of spearmint. Combine all ingredients then fill the rest of the container with water. The goal is to have 10 parts water to 1 part castile soap. Winter: Cinnamon Bark, Spruce, Balsam Fir, Peppermint. Fall: Ginger, Nutmeg, Clove, Patchouli, Sandalwood. Spring: Lavender, Geranium, German Chamomile, Jasmine. The kids are happy again. 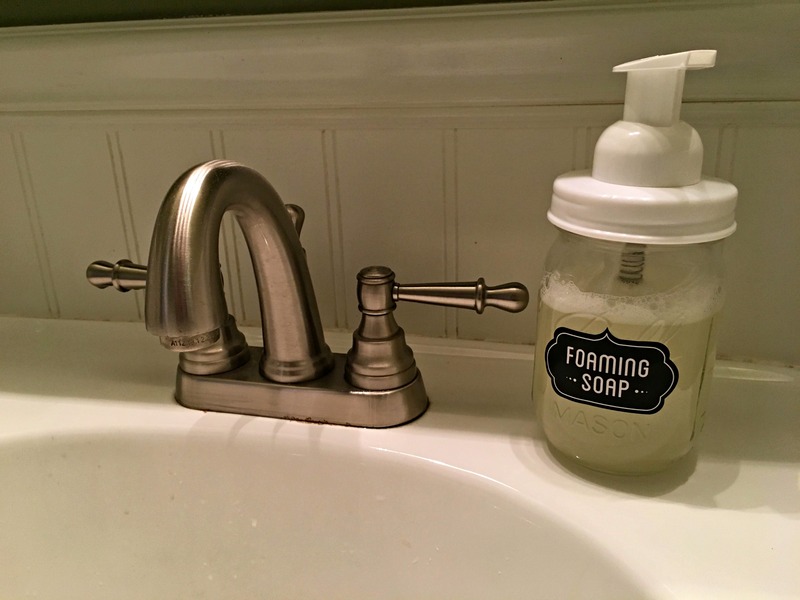 DIY Organic Foaming Soap that we can make anytime. WIN Young Living’s Citrus Fresh Essential Oil! Links may be affiliate. This giveaway will end on July 25, 2018 at midnight MST. Winners will be drawn via rafflecopter. Once a winner is drawn I will contact them and they will have 48 hours to reply before I draw a new winner. Giveaway is open to anyone in the US. You must be 18 years of age or older. Giveaway is not affiliated with Facebook & I release them of liability. Winner will be posted in the rafflecopter widget. I haven’t tried to make my own products. I would like to give it a try. 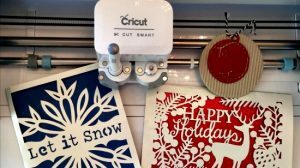 I would love to make my own products. I just don't have the time. I'm busy fixing every food from scratch because I am allergic to everything. 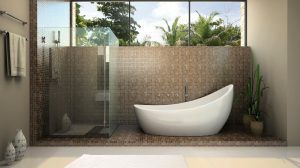 I've never made my own bath or products before, but I'm really interested to try! I have done a little experimenting with DIY creams with essential oil, but I haven't made any bath products yet. This sounds fun and I want to try it. I have not made my own soaps or creams. I know people who do but I'm not that crafty. I use essential oils in a diffuser so I would use the prize for that. I like your idea of the jar and pump. I have made DIY creams with essential oil, bu I have made anything for the bath. I'd love to try this! I have never made my own soap, but have added essential oils to distilled water for spritzing. I usually make our foaming soap but I usually use an already made soap and just dilute it with water and add to a foaming dispenser. Yes lazy I know! My Aunt Sally has been wanting to teach me how to make my own soaps but I haven't had the time to fly out to visit her. In the past I've combined a couple of essential oils to make a fragrance, but that's it as far as making anything with essential oils. No, I've only used essential oils in a diffuser. I've added oil to lotions to scent them. Yes, I make foaming soap by mixing Dr. Bronner's liquid soap, water and essential oils. I've never made my own bath products. I have a kit to make some lip balm but haven't tried it yet. I haven't made my own bath products before. I love oils but have never tried making soap. I love citrus scents because they always smell so fresh and clean. This would be great to have. I've never attempted to make soap with essential oils but I think I would most definitely try if I'd win. I havent made my own products before but I have a friend who does. I made a counter cleaner with essential oils before. I’ve made foaming hand soap but haven’t used EOs to do so. No I've never tried making bath products with essential oils. I have made beauty products. I made bath salts. I have used essential oil to make homemade cleaner. I love using essential oils. I have added a few drops of oils to my soap dispenser. No I've never made my own before. I have made salt and sugar body scrubs with essential oils before. This soap looks like a great diy. I have not created this before. I have never made my own bath or beauty products with essential oil! I will definitely have to try sometime though, this soap sounds amazing! I have never made my own soap but thinking about trying it. I've made bath salts, but never soap. Thanks for the contest. I use essential oils, but have not made any soaps yet. You have me considering it though! I made a bath product once! I have not but my friend has her own little company that does. I have not made my own. I like citrus aroma and would like to try it. I've not made my own soaps but I do make my own household cleaner. I love this idea though. Yes, I have. I made a sea salt coffee scrub. I've only a few of my own bath and body products. Always ready to find new creations! I haven't tried to make my own bath products with essential oils as of yet. I haven't made any. These products sound great. I haven't made my own bath/body products with essential oils before.